London, England, UK. Two of the synagogues open to the public on September 6th. Above, the magnificent Victorian-era New West End Synagogue designed by George Audsley and built form 1877-79 and below the Fieldgate Street Great Synagogue, actually a simple East End Synagogue, built in 1899 and still in use. Photos: Samuel D. Gruber. Across the United Kingdom Jewish organizations, institutions and congregations are joining forces for the tenth straight year to open their doors to the broad public as part of European Days of Jewish Culture and Heritage. 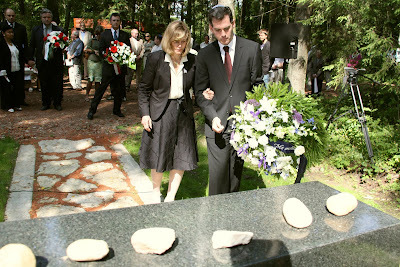 The annual event was first organized in 1996 by the B'nai B'rith Lodge in Strasbourg, France. It has now spread to 27 countries, and approximately 200,000 people participate each year. In the UK, B'nai B'rith UK is the primary organizer, with support from Jewish Heritage UK and dozens of local organizations. This year, over 90 events are offered, including open synagogues and tours, historic and architectural walking tours, concerts, exhibitions and lectures. It is impossible for one individual to take advantage of more than a handful of activities, but the organizers have wisely spread events over the period of more than an entire week, beginning September 6th with some events offered as late September 16th. London, England, UK. 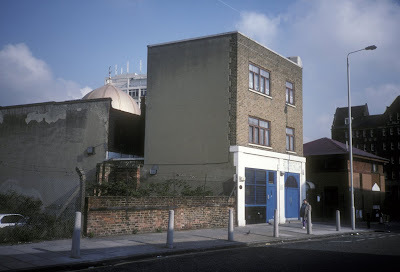 The former Spitalfields Great Synagogue on Brick Lane was built as a Huguenot Chapel and is now a Bengali Mosque. 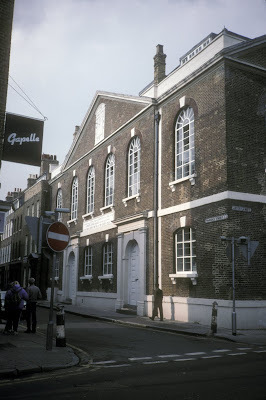 A visit is scheduled on a walking tour of the Jewish East End. 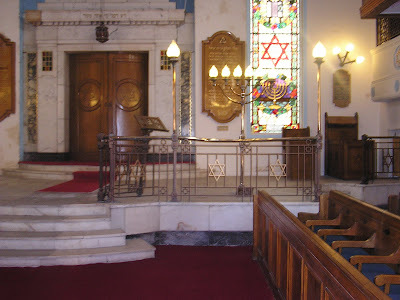 If you live in are are visiting the UK have always wanted to visit a particular synagogues - this is your chance. If you can't decide, then take a look at the popular guidebook Jewish Heritage in the England: An Architectural Guide. Or better still, try on of nine different walking tours offered in London on September 6th, or tours in Richmond or York. In addition to 12 synagogues open in London on Sunday, September 6th, you can also visit synagogues in Bangor, Bradford, Brighton, Bristol, Chatham, Cornwall, Lincoln, Liverpool, Manchester, Ramsgate, and Reading. (ISJM) On July 22, 2009 Jan Kixmüller reported in the Potsdamer Neueste Nachrichten that the University of Potsdam is partnering with the Jewish Museum Berlin to further identify, investigate, transcribe and translate various items discovered in a geniza in Memmelsdorf (a Franconian town in Southern Germany) in February 2002. The Genizah was discovered during the renovation of an old half-timbered building, when a ceiling fan was removed, and a linen bag containing a variety of Judaica fell from the ceiling. In the bag were fragments of Jewish prayer book, a community order, letters, a calendar, lottery tickets and business cards. 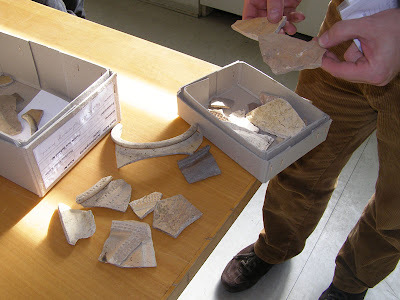 Investigation of the space in the ceiling revealed other items – not all typical of a Genizah - including childrens' shoes, tobacco and prayer belt pouch. Though many genizot from synagogues have been found, including one in the (conserved and open to the public in 2004) former synagogue of Memmelsdorf discovered in 1979, such finds from private houses are rare (I can’t recall any). 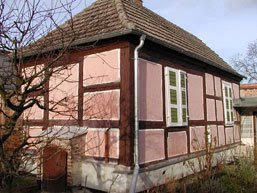 Researchers have determined that the house in Memmelsdorf had been owned by Jews from 1775 until 1939. The fate of final Jewish owners is unknown. The Geniza materials date from 1770 to 1830. Now, Jewish Studies students at Potsdam University’s Wintersemester are selecting items from the Genizah for research and exhibition. This the first cooperative project between the University and the Museum. The full significance of the collection, which was purchased by the Jewish Museum Berlin in 2003, remains to be researched. The 1990s was a period of renewed interest in rural German Jewish culture. Hundreds of forgotten former synagogues - many reused as homes, garages, workshops, and firehouses - were identified. Researchers were on the lookout for genizah materials. Some of these were literally rescued from dumpsters where they had been tossed during local construction work, as this was also a period of renovation of older buildings by a new and more prosperous generation. In addition to materials from Memmelsdorf, much material was found in the former synagogue of Veitschocheim near Wurzburg and has been studied and conserved and is on view in a permanent exhibition next to the restored synagogue in that small town. Genizot materials as especially valuable to historians for several reasons. They usually contain otherwise unknown printed works - often ephemeral but once popular items including religious and secular texts. Genizot also often contain original unique documentary material often of a personal nature, including receipts and contracts. In Germany they shed light on many aspects of everyday life for Jews in small towns and villages, and they also include material valuable in the interpretation of local Hebrew and Yiddish language usage. The Potsdamer Institute of Jewish Studies Potsdamer is one of the largest (perhaps the largest) such program in Germany, with more 300 enrolled students. The Berlin Jewish Museum is the most visited Jewish Museum in Europe. The collaboration between Potsdam and Berlin in intended to benefit both institutions, and to help shape the next generation of German Jewish museum scholars and professionals. Lecture: Gruber to lecture in Portsmouth, Virginia on "The Architecture of Immigration: American Synagogues from 1760 to 1920"
"The Architecture of Immigration: American Synagogues from 1760 to 1920"
Jews came to America in three main waves. In the 17th and 18th centuries, descendants of Spanish Jews – mostly living under Dutch or English rule – settled in the New World, and many participated in the War of Independence. By 1800, these Sephardi Jews built synagogues in five cities – Philadelphia, New York, Newport, Charleston and Savannah. By the mid-19th century, thousands of Central European Jews joined the mass emigration to the United States caused by political unrest and economic instability in Europe. Many started as peddlers but then settled in hundreds of towns throughout the American south and west, playing a pivotal role in the expansion of the American frontier and the cohesion of the new nation. A third wave of immigration from Europe was by far the biggest. Millions of Jews fled Eastern Europe, particularly those territories controlled by Russia and repressed under Tsarist rule. From the 1880s to the 1920s hundreds of thousands “Russians” settled in North, numerically overwhelming older Sephardic and “German” populations, though it took a generation and more before they established political and economic parity, and developed a synagogue architecture of their own. This lecture traces this history through the religious buildings erected by each Jewish immigrant group. Through a rich architectural legacy, Dr. Gruber examines the history, experiences, tastes, influences and aspirations of American Jewish immigrants. The Jewish Museum & Cultural Center opened in March 2008 in the former Chevra T'helim Synagogue, built in 1918 and closed in1985. In 2002, the Friends of Chevra T'helim, Inc., formed a 501(c)(3) organization and stepped in to preserve this historic landmark. They acquired the building, and launched a Capital Campaign to raise $500,000. Architect John Paul Hanbury of the firm of Hanbury Evans Wright Vlattas & Company, noted for their excellence in historic preservation, oversaw the restoration. The former synagogue, now completely restored, has been recognized by the National Trust for Historic Preservation and is listed on the Virginia Historic Register. SAMUEL D. GRUBER is Director of the Jewish Heritage Research Center (Syracuse, NY); and president of the International Survey of Jewish Monuments. From 1989 until 1995 he served as founding director of the Jewish Heritage Council of WMF and from 1998 through 2008 as Research Director of the U.S. Commission for the Preservation of America's Heritage Abroad. Since 2001 he has been the Rothman Family and Holstein Family Lecturer in Judaic Studies at Syracuse University. He is author of American Synagogues: A Century of Architecture and Jewish Community (Rizzoli, 2003) and Synagogues (Metrobooks, NY, 1999); and author or editor of numerous articles and survey reports about Jewish monuments. Dr. Gruber received his B.A. degree in Medieval Studies from Princeton University, and his Ph.D. degree from Columbia University in the History of Art and Archaeology. He is a Fellow of the American Academy in Rome. He has recently received research grants from the James Marston Fitch Charitable Foundation, the AIA New York Chapter the Cahnmann Foundation and the Delmas Foundation. Dr. Gruber serves on many charitable boards and advisory committees. He is President of the Preservation Association of Central New York and Co-Chair of the Building Centennial Committee of Temple Concord in Syracuse. (ISJM) Today was the reopening of the restored Art Nouveau synagogue in Riga, Latvia, first opened in 1905. Much of the credit for this project goes to Gita Umanovska,. Executive Director of the Riga Community. Gita was instrumental in preparing the application the resulted in EU funds for the project as part of a larger tourism/economic development grant to Riga. As in many of the Jewish heritage projects in Latvia undertaken and completed in the past half decade, much of the success is also due to the organizational, inspirational and financial support of Community president Arkady Suharenko. At the end of this blog entry I attach a passage from my travel notes written in September, 2003, after attending Saturday morning services at the synagogue. I have visited the synagogue several times, but believe the architecture of a synagogue is usually best seen when the building is in use. This synagogue, needs to be seen close up and in detail, too. 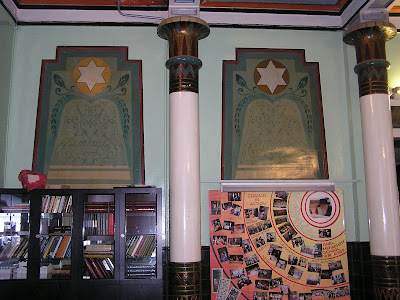 It is one of the last - perhaps the very last - major synagogue to widely employ Egyptian decorative motifs. Perhaps this is an influence from Copenhagen, where the Egyptian Revival was very strong, as the synagogue there bears witness. RIGA, Latvia – This week in Riga, after two years of restoration work, the doors of the Peitav Shul – the only synagogue in the Latvian capital – will finally open once again. Reconstruction work on the building began in 2007 at a cost of more than $2.8 million. While most of the funds were contributed by foreign sponsors, financial support was also pledged by the Latvian government and about 100 other donors. The outstanding balance needed to complete the necessary work was raised from amongst members of the local Jewish community. About 1,000 local Jews donated sums ranging from $10 to $100,000. The names of all donors – regardless of the size of their contribution – are forever engraved on a plaque located at the synagogue’s entrance. When work began on the synagogue it became apparent that the building was in much worse condition than originally thought. As a result, nearly 60 percent of the roof had to be replaced. When the funds dried out once again, two members of the Jewish community’s Board of Trustees – Leonid Esterkin and Arkady Sukharenko – each made a sizeable contribution. 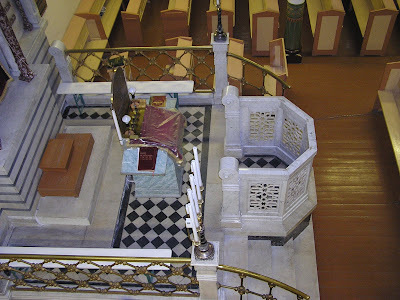 I recount my experience at the synagogue, since it is one the few Jewish experiences in Latvia available to visitors from America or elsewhere. 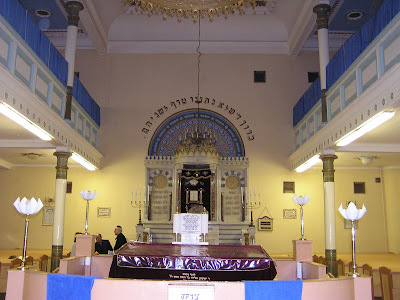 The activity at the synagogue constitutes one relatively small part of the Latvian Jewish life – the religious – but it is the religious community that is fully recognized by the government in issues of property restitution and other areas, so the synagogue and its supporters have special influence in the definition of Jewish life and community, and on financial resources, in Latvia today. I counted about sixty men in the synagogue during the service. They weren’t all praying, or even pretending to follow along. A large number kept up an incessant chatter throughout the service, and especially throughout the Torah service. About a dozen women looked down from the balcony, where they not only were separated by the height and space, but by a high blue curtain as well. The women would lean on the parapet wall with the curtain pushed behind them. They tended to bunch in pairs, one on each side of a column. There were old women. There really was no danger of sexual distraction form them. Barkhan led the “warm-up” prayers. He could hardly be heard, but he read at the shtender (reader’s stand) set on the platform before the Ark. Then the cantor, a fairly young man with a wonderful voice took over. He apparently teaches music at the university. Few there can read any Hebrew or know the prayers. is in Hebrew with Russian translation on the facing page. There are transliterations in the back of the siddur. (Kadosh Kadosh Kadosh was the prayer that get the most response, it was prayed as Kadoish, Kadoish, Kadoish). Most of the Torah reading was done by another Lubavicher, but the first section was read by a visitor, a man from Israel. As a visitor, I was offered an aliyah (opportunity to “go up” to the Torah and recite the blessing before and after the Torah reading), which I accepted, and recited the blessing in Hebrew. Most others read Russian transliteration printed on a sheet on the bimah. After services I attended the kiddush in the social hall in the synagogue basement. This was set up with long tables and all the participants sat down for a traditional Jewish meal. It may be that like in L’viv many attend the service just to receive the free meal. There was herring and bread, chopped beets, and a cholent. I left after this, but more courses were being served. Rabbi Glasman gave the Barucha, and he also had everyone recite, word by word, the Barucha over the bread, though many had already started eating. Then one older man sang with a fine voice a long song in Yiddish about studying Torah (or Toyrah). (ISJM) The Turkish Press site Today's Zaman reported on August 12th (2009) the discovery of an ancient synagogue in the Lycian port city of Andriake, located on the south coast of Anatolia in a region rich in archaeological sites. The building is the first synagogue discovered in the ancient province of Lycia, but remains of other ancient synagogues in Turkey have been found in Priene on the Ionian coast, and at Sardis north of Andriake. There are numerous ancient textual references to the once-large Jewish population of the Greco-Roman Anatolian coastal towns, including of course, the writings of Saint Paul, who was a Jew from Anatolian Tarsus (further east along the coast). The location of the apsidal synagogue was near the sea, recalling the location of synagogues of Ostia (Italy) and Thessaloniki ( Greece). The discovery may give support to arguments that favor waterside locations for ancient synagogues. A centuries-old Jewish temple has been uncovered in Antalya during the excavation of an ancient port city. (ISJM) The dedication ceremony for new markers on the sites of three former Nazi-created labor camps in Eastern Estonia, originally scheduled for July, took place on August 7th to accommodate distinguished visitors participating in the event. You can read about the camps and markers in my previous blogpost. 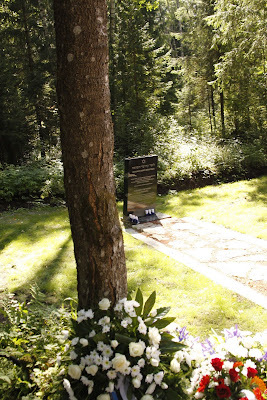 Mr. Evgeni Kapov, of the Internet Portal Delfi, has posted pictures online from the Dedication Ceremony in Kohtla-Nõmme. 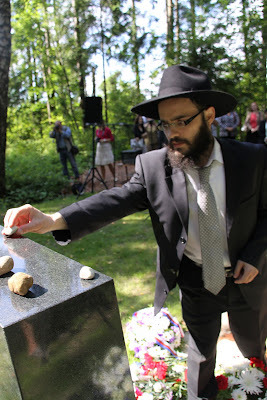 I have posted a few of Mr. Kapov's photos of the ceremony and you can see more pictures here. Between 1941 and 1944 the German occupying powers established 20 labour and concentration camps in Estonia. Thousands of people from a number of countries were killed in these camps because they were Jewish. Cologne, Germany. 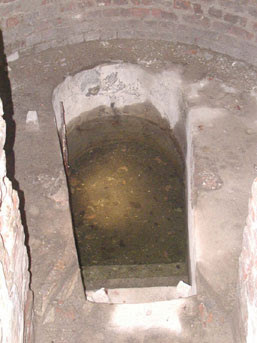 Visitors try to view medieval mikvah protected (hidden) beneath a glass pyramid. Photo: Samuel D. Gruber 1989. Cologne, Germany. 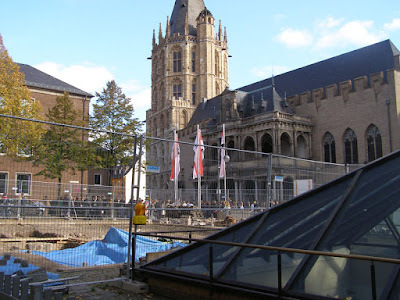 View from mikvah towards Rathaus (City Hall) with synagogue excavation in between. Photo: Samuel D. Gruber 2007. (ISJM) Last month the plug was pulled on plans to construct an impressive (some would say too impressive) Jewish museum in the historic Jewish center of Cologne, Germany, exactly atop the site of the former synagogue, which archaeologists believe may date to as early as the 4th century C.E. I wrote about this project last summer. Plans for the museum were announced with great hoopla last year by a private association that received the rights to build and operate the center on one of the most important sites in the city - immediately across from the town hall, and almost adjacent to the Wallraf-Richartz Museum C built after 1996 and designed by noted Cologne architect Oswald Mathias Unger . This entire civic area sits atop the ancient Roman administrative center. 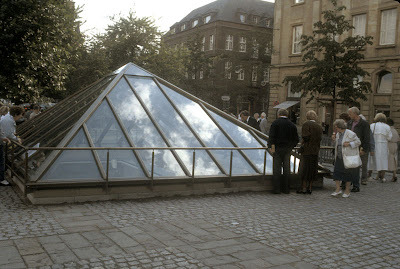 The private Association "Society for the Promotion of a House and Museum of Jewish Culture" that was to finance the Jewish Museum wrote to the Cologne City Council that it did not have the funds for the project nor would it be able to raise them. The Society cited the present poor economic situation as the reason for its inability to fund the project, but this seems an excuse, since it was clear at the time of the acceptance of the project that the Association did not have the funds needed nor did they have a reliable plan for raising the needed money. Skeptics last year claimed the project unfeasible and that in the end the city would be shamed in to taking it over - in order to salvage an important cultural endeavor, but also to escape charges of neglect of Jewish history. Now the question is - have expectations been raised for this large institution - and will the city council feel obliged to step in and rescue the plan? No decision will be made until after local elections on August 30th. 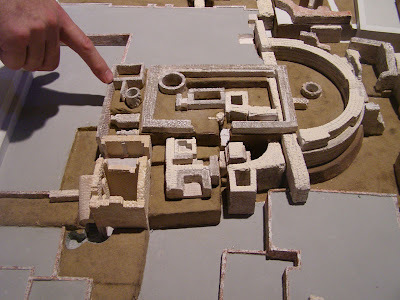 Mayor Fritz Schramma (CDU) has in the past preferred a smaller plan that would incorporate the synagogue remains into the large archaeological park that includes all of the excavated ancient and medieval elements in the area. To me, this is a sensible approach. In the end more people would learn of the long presence of Jews in Cologne, and all would better understand Jewish history in the city as one that was long integrated into the urban, social and economic fabric. There can still a plenty of room for detailed historic and interpretive exhibitions and temporary displays focusing on different aspects of Jewish history and Judaism. Lithuania -- update on fire damaged Pakruojis wooden synagogue. So far, no good plans have been put forward to save the former synagogue, but there has been talk. As usual the issues are responsibility and jurisdiction, long term care and use, and of course, money. Syracuse, NY. Former Temple Adath Yeshurun when in use as a theater. Syracuse, NY. Former Temple Adath Yeshurun with exterior cleaned, awaiting adaptive reuse. Syracuse,NY. 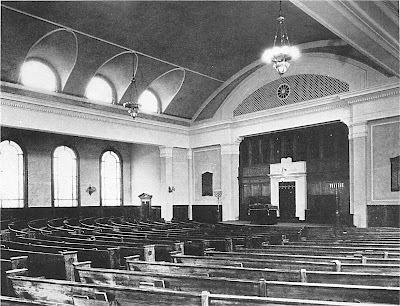 Temple Adath Yeshurun sanctuary in 1930s. Gordon Wright, architect. Last April, Reform Temple Society of Concord in Syracuse, NY, dedicated in 1911, was added to the National Register of Historic Places. 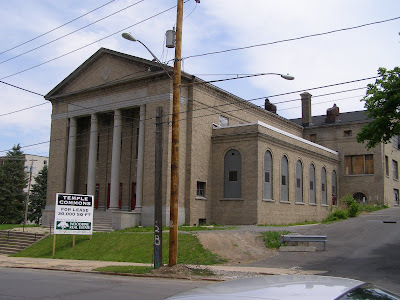 It is the only pre-World War II synagogue building in Syracuse that retains it original congregation and use. The congregation, founded in 1839, will begin celebration of the centennial of the building next year. Meanwhile, the nearby former Orthodox Beth El was abandoned by its congregation in the 1960s. For awhile, it was a Baptist Church, and now it is used by a Messianic "Jewish" congregation. 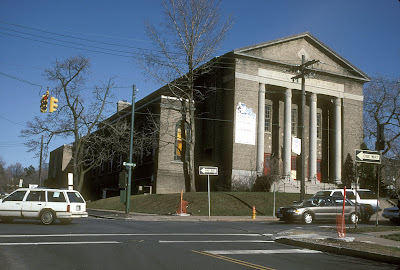 The third historic synagogue building at the corner of Harrison St. and Crouse Ave. on "The Hill" (adjacent to the ever-expanding campus of Syracuse University) is the former Temple Adath Yeshurun (TAY), designed by noted Syracuse architect Gordon Wright and dedicated in 1922. The congregation, founded in 1870, had previously occupied the Naistadter Shul built 1878 on Mulberry (now State) Street, just down the hill to the west in what was once the city's prime area of Jewish settlement. Most of the district was demolished as part of 1970's "urban renewal." Wright's brick building is prominently sited and can be seen from afar. The design is simple stolid and severe. It distinguishing exterior feature is 4-column portico in antis, where the columns are unusually tall and narrow, culminating in Egyptian-influenced capitals. A inscription is on the frieze in Hebrew and English declares (from Psalm 118) "Open Ye the Portals of Righteousness I Will Enter and Praise God." A Star of David is set into the pediment. TAY's congregation left the building in 1968, and moved to a new complex designed by Percival Goodman just inside the city's eastern boundary. 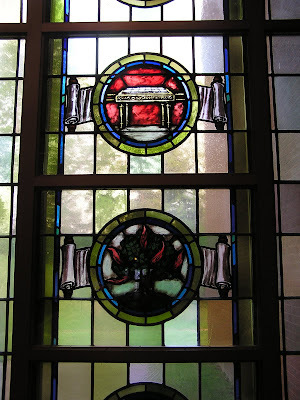 They took some of the stained glass windows which are now installed in the vestibule area between the sanctuary and the social hall (see pictures). Syracuse, NY. Temple Adath Yeshurun (Kimber Road). 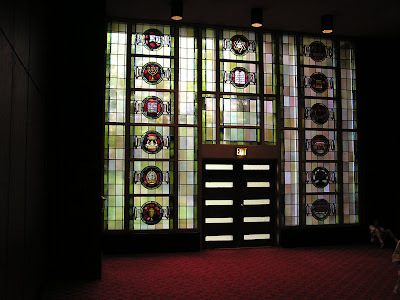 Parts of stained glass windows from 1922 sanctuary inserted in 1969 building. Photos: Samuel D. Gruber (2005). 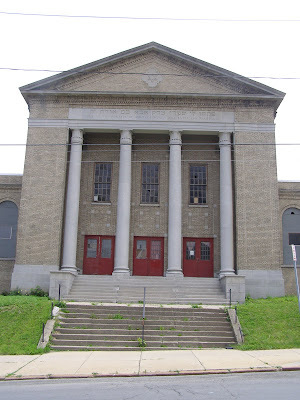 In something of a forced deal, the city of Syracuse bought the large classical-style building from the congregation. Stuck with what many considered at the time (of great economic stress) a "white elephant," the city eventually leased the site to a local theater company. Then, in 2004, when was shown that the Salt City Center for the Performing Arts had failed to sufficiently invest in the building's maintenance, and to keep it up to code, the city evicted the theater group and the building sat empty. The theater had blacked out the sanctuary, and subsequent water damage from the leaking roof destroyed interior plasterwork. Some patterned stained glass was still visible in the building a few years ago. Its not clear what has happened to this. 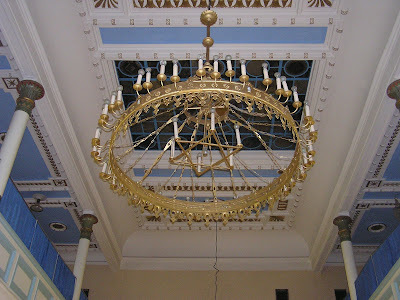 In an auction of the theater's assets, several architectural elements of the building including chandeliers and lights fixtures were inappropriately and possibly illegally sold. In 2006, local developer Norman Swanson, who owns two nearby hotels and many other properties, offered to buy the building from the city for $352,000 through his company the Woodbine Group. His plan, at a time of increased interest in upscale city housing, was to convert the building to spacious condominiums, and to add on a new apartment tower wing near the building rear, in an area that was already surface parking. The the already compromised interior articulation of the building would be lost, but Swanson promised to restore the exterior, to maintain it "landmark" presence in the neighborhood - an area where much of the older architecture has already been demolished for University and Hospital expansion. The City of Syracuse accepted Swanson's proposal over another which would have utilized the interior for a restaurant and entertainment space, figuring that Swanson was more likely to be able to find funding for his project. The Preservation Association of Central New York (of which I was Board President) analyzed both plans and endorsed Swanson's as the best way to both save the empty and deteriorating building and to benefit the local tax base, too. The difficult economy which compounded the always difficult development process in Syracuse postponed Swanson's plans. He did go ahead with the exterior restoration, but had to change his plan for housing to project with commercial space (to be called "Temple Commons." That plan, too, has failed, and now Swanson will break ground in October on a new adaptive reuse plan, transforming the building into a boutique hotel. Running hotels is something Swanson does well, and a few years ago the Preservation Association gave Swanson's company an award for its sensitive transformation of the 1920s Medical Arts Building into Parkview Hotel. Despite problems in the local hotel market (the nearby Renaissance Hotel, next to to the Parkview has just gone into foreclosure) Swanson believes he can make the new hotel work - drawing on the constant need for high quality rooms near the University, three local hospitals, and new research facilities. Swanson hopes to make use of various tax credits, and his goal is to receive a gold certificate from the U S green Building Council as art of the LEED (Leadership in Energy Efficient Design) program. The building, may also be eligible for some Historic Preservation Tex credits. The Preservation Association which continues to support the project, has long maintained the most energy efficient building (when considering issues of embedded energy and the energy needed for demolition and new construction) is an older building that continues in use or is reused. Architect Gordon Wright built two other notable religious buildings in Syracuse. Both the downtown Gothic style Mizpah Tower, renowned for its exceptional and extravagant auditorium, and the former First Church of Christ Scientist are unoccupied and endangered. The First Church of Christ Scientist had been purchased by a local credit union to be developed as an Art Center, but this project has been difficult to sustain, and the former church is now again up for sale. Anne Frank was imprisoned and worked at Westerbork in the late summer of 1944 after her Jewish family was captured in their Amsterdam hiding place - now known worldwide as the Anne Frank House. According to Mulder, Anne Frank and her sister Margo worked there for about four weeks in a factory dismantling batteries. Police will begin an investigation into the cause of the fire once asbestos released in the blaze has been cleared up, the paper said. Mulder said he was aware of one other barracks still in its original condition which is currently being used to house pigs. During the Nazi occupation of Holland, more than 100,000 Jews were deported to concentration camps from Westerbork. (ISJM) Last month the town of Schwedt / Oder in Brandenburg, close to the Polish border, announced the completion of the reconstruction of the former mikveh complex (Jewish ritual bath), including the former house for the shammas of the synagogue, which was situated on the sourthern part of the site until its destruction in the 1930s.. The property is at "Gartenstraße 8 and Louis Harlan Street 1" on the western edge of Old Town. 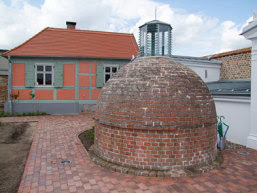 The restoration is one of an increasing number of Jewish heritage projects that have developed in towns and cities of the former East GermanyUntil German reunification twenty years ago, much of the Jewish history of the region and most Jewish sites were ignored or misrepresented. The rectangular-plan synagogue, designed by master mason G. Michaelis, was built in 1862 and destroyed on Kristallnacht in November 1938. According to published reports, the shammas’s house was built in two phases. First, a one-story roughly square structure with a pyramidal timber roof on a roughly square plan as erected – this may have previously been a garden shed or work building owned by the previous owner of the land between the late 18th and the mid-19th century when the site was acquired by the Jewish community, at which time the structure was expanded to the east. Oder, and an exhibition on the Jewish history of the town will be installed. 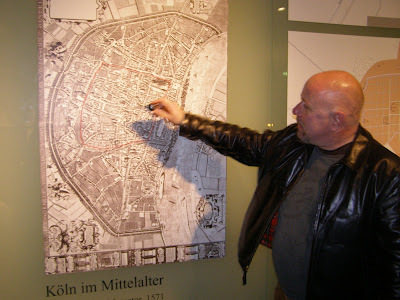 The project was sponsored by the Office of Construction and Transportation of the State of Brandenburg in the framework of the Federal program "Urban redevelopment and development activities" within the redevelopment area "Old Town / Lindenallee" by the German Foundation for Monument, from the television lottery "spiral of happiness” and by donations of the Rotary Club of Schwedt. According to the Infrastructure Ministry the project cost was about 320,000 euro. Other reports put the cost closer to 500,000 euro. Bedzin, Poland. Wall painting fragment from Beit Midrash. 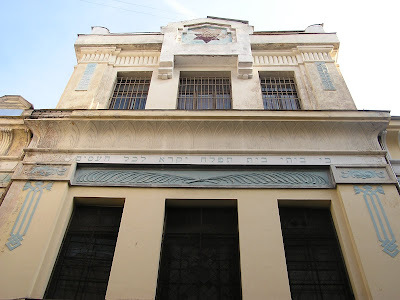 (ISJM) On July 17, Ruth Ellen Gruber reported in her blog about a visit to the re-discovered Beit Midrash (study house) in the Polish town of Bedzin. Located in an apartment in a non-descript apartment building, the prayer room is notable for the remains of wall paintings which have been uncovered from layers of overpaint. The painting appear to be fairly typical for this type of decoration. From the 1890 through the 1920s a combination of Jewish symbols - mostly referring to the Jerusalem Temple - and scenes of the Holy Land (often derived form postcards) were very common for synagogues and prayer houses. Part of the popularity of these images was due to their availability in new media (books, magazines, postcards) - which were creating a new version of global Judaism. images of the Holy Land were also associated with a yearning for Zion - and this was common for both religious and secular Zionists. The scenes in synagogues, however, are always set in a Biblical time, even when, on occasion, more modern elements creep in to the depictions. The Bedzin paintings, while not particularly sophisticated, are an important addition to a the small number of preserved examples of such painting. 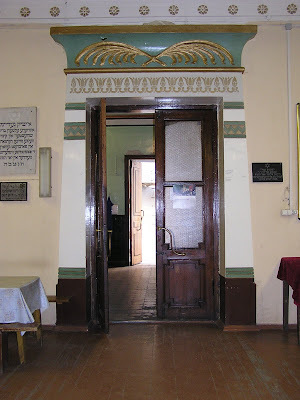 The Prayer House is located in an upstairs apartment at Aleja Kollataja 24 -- in a building that was part of a grand complex of tenement dwellings and businesses owned by Nuchim Cukerman. You have to enter a narrow courtyard (open at one end) and climb the stairs. After World War II, the Prayer House was divided into two rooms and a kitchen, to serve as a flat. The paintings were covered over by cheap paint and stenciling. Apparently the owner always knew about the hidden murals, which became known publicly a couple of years ago, when high school students were brought in to clear off some of the over-paint with sponges and water. 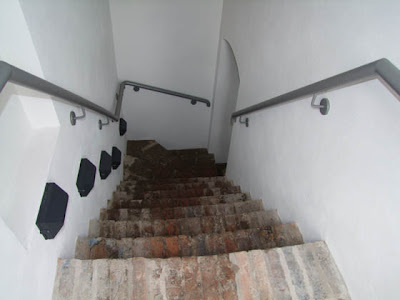 [This past]... March, young people in the town created a Foundation -- the Fundacja Brama Cukerman (Cukerman's Gate Foundation) -- to conserve and protect the prayer house and make it available for visitors as part of Bedzin's rich Jewish heritage. The Brama Cukerman Foundation is also placing plaques on former Jewish sites, including places of business, such as a one-time Jewish cinema house, around town, to create a heritage route. Click here to read the complete report and see more photos. Top: Tekkumbhagam Synaoggue in Ernakulam (a part of Kochi). (ISJM) International Survey of Jewish Monuments (ISJM) member and architect Jay Waronker has concluded a productive working trip to India sponsored by ISJM with support from the Koret Foundation, during which he continued research on Kerala synagogues, and continued to work on ongoing projects of synagogue protection, preservation and public presentation. During his stay, Waronker also met with officials of the Kerala Department of Tourism to help further plans for the restoration of the Parur synagogue. Work on the project, which includes restoration of the synagogue and an adjacent Jewish house, will begin this fall and be completed by the end of 2010. 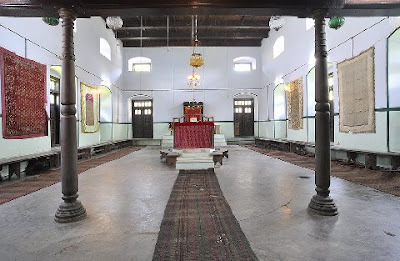 According to Waronker, "although each of the seven surviving Cochin synagogues possesses unique qualities, particularly the Paradesi Synagogue since it is the only still functioning and fully intact sanctuary, it is the one at Parur, also called Paravoor, and located to the north of Kochi (Cochin), which is the most architecturally distinctive. While closed for a number of years and in derelict condition, it represents the most complete example of a synagogue incorporating the many influences of building design that shaped Kerala. With its chunam (polished lime) over laterite stone walls featuring restrained detail, wood floor and roof framing exposed at its deep eaves, and clay roof tiles covering its pitched surfaces, the Parur Synagogue is an archetypical example of the local thachusasthra style. 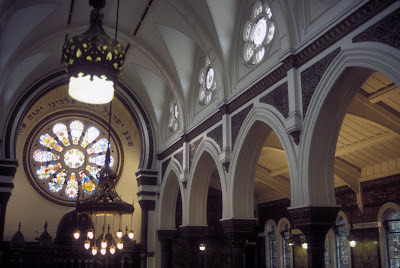 As with other Cochin synagogues, it is made up of not one building but a collection of parts forming a distinct compound. Parur is notable for having the greatest number of connected and consecutive pieces which have survived fully intact, albeit rotting and crumbling. Unique to this synagogue is the way its parts are formally arranged and linked in a highly axial and ceremonial fashion." The Kerala government has also invited waronker and his team to coordinate an exhibtion on the history of the Parur community, which will be housed in the restored synagogue and adjacent Jewish residence. 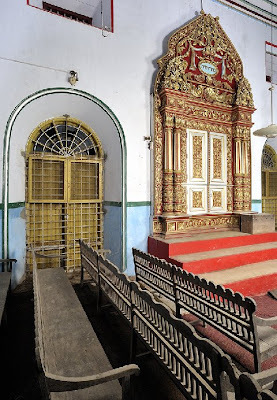 While in Kerala, helping to facilitate the Parur restoration, Waronker also wrote and supervised the installation of heritage plaques about the history and architecture of the closed Kadavumbhagam and Tekkumbhagam Synagogues in Ernakulam and for the closed Kadavumbhagam Synagogue in Jew Town/Mattancherry. 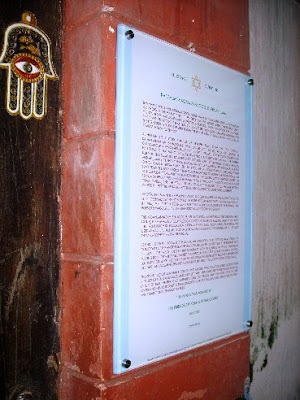 These tri-lingual signs have been posted on the building exteriors for the benefit of visitors. 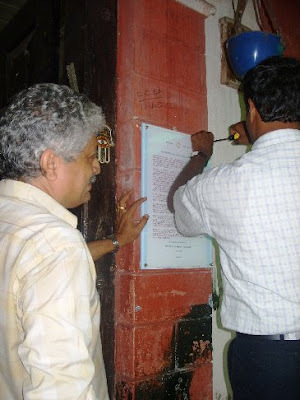 Installation of heritage plaques at (former) Kadavumbhagam Synagogue in Ernakulam. He also wrote and had printed an information sheet on the architectural and religious features of the restored Chennamangalam synagogue which will be distributed free of charge to visitors. Kerala Department of Archeology officials report that during high season nearly 200 people a day visit the synagogue/museum. Waronker also updated and printed new copies of a brochure in both English and Malayalam that he first produced in collaboration with Dr. Shalva Weil of the Hebrew University and Marian Sofaer of Palo Alto, CA, on the social and architectural history of the Chennamangalam synagogue. Waronker had previously helped plan the permanent exhibition in this synagogue, and on this visit he met with the new director of the Kerala Department of Archeology to review tasks that were never completed during the previous restoration phase, including the hanging of traditional lanterns and lights. As a result of these discussions, Waronker will also join a team of Indo-Judaic scholars in planning a permanent exhibition on the history of the Kerala Jews in a still to-be-built museum as a part of the impressive Muziris Heritage Site project. 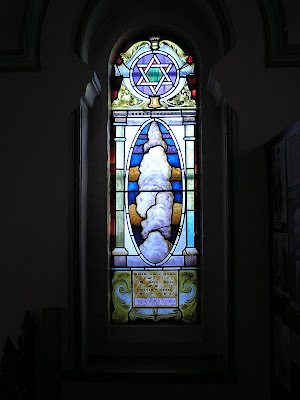 While in Kerala, Waronker also interviewed various Kerala Jews to learn even more about the history of the synagogues and re-visited all seven of Kerala's synagogues, photographing and noting their current conditions. ISJM - through the work of Jay Waronker and other researchers and preservationists, will continue to be engaged in India. New York City's Museum at Eldridge Street has posted some worthwhile publications on-line. The Academic Angles 2007-08 lecture series sponsored by the National Endowment for the Humanities is now online in the form of a complete booklet, and as individual essays. In addition, audio files of some of the lectures are also posted. Eight lectures look at the history and restoration of the Eldridge Street Synagogue from different "academic angles." Marilyn Chiat and I both contributed essays focused on historic preservation. My written topic is The Choices we Make: Eldridge Street Synagogue and Historic Preservation. My somewhat longer talk (those who know me know how long my talks can be!) - in audio form - also deals with the architectural history of the American synagogue, especially in New York City (for the record, I have not gone back to listen to what exactly I said when I went off-script). Marilyn Chiat's essay, which draws especially on her experiences preserving historic synagogues and other religious sites in the Minnesota and the Midwest is Saving and Praising the Past. Other contributors are historians Deborah Dash Moore, Jeffrey Gurock, Jeffrey Shandler, Tony Michaels, Riv-Ellen Prell and Daniel Soyer. Historian Annie Polland, who helped organize these lectures and is the author of her own history of Eldridge, Landmark of the Spirit, has left the Museum to take up a similar role at the Lower East Side Tenement Museum. Annie's presence there is a good omen of what we can expect to be a growing and continuing cooperation between the two important Lower East Side cultural institutions. I wish Annie well in her new position and look forward to reporting on her programs. The Museum at Eldridge has also posted its 2008 Annual Report on-line. This is a tremendous resource for any historic synagogue organization as it provides so many examples of creative and effective programming, and when read carefully, can also serve as a primer in fund-raising. (ISJM) Partners in Preservation is a recent initiative begun by the National Trust for Historic Preservation and American Express in Boston which this year has offered $1 million for ten local preservation projects. The project is unique in that it allows for on-line voting to determine which sites out of all those nominated will receive funds. After all the votes were tallied last spring, The Vilna Shul, Boston’s Center for Jewish Culture – the only Jewish site nominated, was shown to have come in seventh and in June it was announced that the Vilna Shul would receive a $90,800 grant. The funds will be used to uncover murals hidden since the 1940s in the historic synagogue's women's gallery. The Vilna Shul is the first Jewish structure to be included in the Partners in Preservation program. The historic building and exhibits will remain open throughout this phase of the restoration project, which must be completed by December 2010. The Vilna Shul, Boston’s Center for Jewish Culture, is the name adopted last year for the former Vilna Center for Jewish Heritage, Inc., created in the early 1990s when the small Beacon Hill synagogue was saved from demolition after it closing. Along with a new name,. 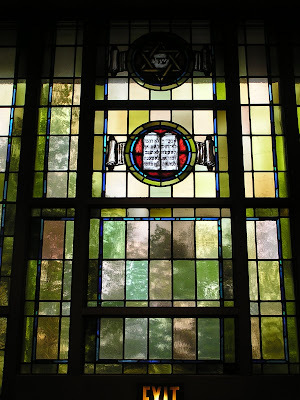 the organization has new goals, and a new mission statement, and has developed a five-year plan to restore the Vilna Shul to its original appearance and to revitalize the building as a center of Jewish culture. Their new mission statement reads: “The Vilna Shul, Boston’s Center for Jewish Culture, preserves the historic Vilna Shul on Beacon Hill as a unique Jewish community venue and resource. It presents educational and cultural programs and exhibits that explore the Jewish experience of Boston.” The Partners in Preservation grant is an important step in the restoration process.